October Gallery is a striking venue in Central London with three unique spaces for hire in which to hold parties, book launches, workshops & meetings. October Gallery was established in 1979 and specialises in promoting the work of international avantgarde artists. Located on the ground floor of an elegant three storey Victorian building this space includes the gallery, a large open-air courtyard garden and a kitchen. This space has capacity for 120 people (standing) and can be hired for social gatherings and cultural events. Located on the second floor, this large naturally lit room has wooden flooring, excellent acoustics, a Bechstein Grand Piano, projection and sound facilities. The space also has washroom facilities. This space is great for lectures, workshops, viewings, rehearsals and small functions. 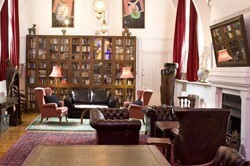 Seated in theatre style, the room’s capacity is 70 people or 80 for a standing reception. Unfortunately, there is no disabled access to this space. 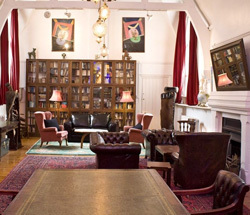 Adjoining the Theatre Showroom is a quiet, spacious room lined with an impressive collection of books, furnished with Oriental carpets, dark leather arm-chairs and a small conference table (seats 10 people). The space is beautifully lit by stained glass windows, takes a capacity of 40 people seated in theatre style and is perfect for important meetings and workshops. The space does not have disabled access and shares bathroom facilities on the ground floor. Please be advised that consumption of alcohol or large meals is not permitted in this space however light meals and tea, coffee and soft drinks are allowed.